When driving around the Monroe County area, it’s important to be behind the wheel of a new 2019 Toyota Camry. Why? For one, it offers unparalleled efficiency that leaves the competition dead in its tracks. And with the bold exterior redesign, the 2019 Camry has been making onlookers jealous all across New York. Don’t believe us? Put the 2019 Camry up against the 2019 Ford Fusion, 2019 Nissan Altima and 2019 Chevrolet Malibu to see how this Toyota sedan rises to the top. Experience the next generation of Toyota sedans when you buy or lease a new 2019 Toyota Camry, for sale at our Toyota dealer near Rochester, NY. Save on the 2019 Camry price when you ask us about our competitive line of 2019 Camry lease and finance specials. The 2019 Toyota Camry has been updated and reconfigured to meet or exceed the needs of modern drivers. With all those highway miles you drive, you’ll love how much the Toyota Camry fuel economy can save you in gas. And with the 2019 Toyota Camry Hybrid, your fuel bills will be even lower. Compare those specs to the 2019 Altima or 2019 Malibu and you’ll see why drivers prefer to get the keys to a new Camry. Plus, when you’re taking on those long stretches of driving, the standard Apple CarPlay™ integration in the 2019 Camry interior gives you the power to stay entertained without being distracted. Pair that with the standard Toyota Safety Sense™ P suite of advanced technologies, and it won’t be hard to see how the Camry pulls ahead of the 2019 Fusion. Whether you frequent Rochester or Canandaigua roads more, you’ll want the 2019 Toyota Camry by your side. 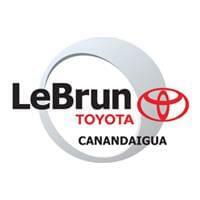 Visit the experts at LeBrun Toyota and we’ll personalize a 2019 Camry comparison for you. We’re happy to detail all the ways the 2019 Toyota Camry specs and features leave competitors in the dust. Take a 2019 Camry test-drive and drive home in the new Camry sedan now!